By Chris Williams: Paulie Malignaggi was greatly impressed with Errol Spence Jr’s win over Mikey Garcia last weekend in Arlington, Texas. Malignaggi notes how Spence (25-0, 21 KOs) was able to dominate Garcia (39-1, 30 KOs) with his boxing ability in the first eight rounds before switching over to his power game to punish him in the last four rounds of their fight on Fox Sports pay-per-view at the AT&T Stadium. Malignaggi says Spence would dominate Garcia with his boxing skills even if he were fighting at lightweight. He just thinks Spence simply as more talent than Garcia, which makes sense. After all, Spence was a U.S Olympian in 2012 . Garcia didn’t go that far in the amateurs. He wasn’t that kind of talent. “I think it was a brilliant display. I think the prevalent thinking before the fight was Errol was going to be too big for Mikey,” Malignaggi said to IFL TV. “Sure, late in the fight he showed his physicality to wear down Mikey. But really what I was most impressed with earlier in the fight was he didn’t make it a physical fight. It’s almost like he chose to say, ‘You know what. I’m going to actually show you that I’m better than this guy first, and out-box him thoroughly, and then in the second half of the fight I’m going to show him that he made a mistake by jumping all those weight classes, and show him that a bigger man is actually a problem. I didn’t think he wanted to make it a physical fight as earlier as I thought he would, but it’s possible he did that just to prove a point. To me, he made that point,” Malignaggi. It was remarkable the way that Spence devoted the majority of the fight to boxing Mikey instead of slugging with him. It’s almost as if Spence wanted to imitate how Terence Crawford fights to show the fans that he can box like him. Spence looked like a bigger, stronger and better version of Crawford (34-0, 25 KOs) last Saturday night. Despite being matched against exclusively flawed opposition since moving up to welterweight, Crawford doesn’t look dominating in the 147 lb division. Spence looks levels above Crawford with his game. When Spence turned it up a gear in the ninth round against Mikey in throwing power shots, he had him reeling. It was such a one-sided round that his trainer Robert Garcia was looking to pull him out of the fight. Luckily for Garcia, Spence slowed up a little in the remaining three rounds of the fight, and this enabled him to make it to the end of the contest without getting knocked out. It was clear from the opening rounds that Garcia, 31, lacked not only the size to compete with the taller 5’9 1/2″ Spence, but he also lacked the boxing skills. With that said, Garcia showed good power, defense and punch resistance. One reason for that wasn’t because Mikey’s chin is any better than the guys that Spence had been knocking out in the last seven years, it’s more of a case of Mikey doing a goo job of partially deflecting the incoming blows with his gloves. Spence’s hand speed wasn’t fast enough for Mikey to have problems tracking where the punches were coming from. As such, Mikey was able to see the shots coming, and then he gloves or arms in the way to partially deflect the punches. Spence was still tagging Garcia with shots, but they had less steam on them. Had Spence landed his shots flush most of the time, he would have likely knocked Garcia out at some point in the fight Also, Spence didn’t start attacking Garcia until the last quarter of the fight with his power shots, and that made it harder for him to get the knockout if he was actually trying to, which you can argue that he really wasn’t trying to do. It looked to this writer that Spence was hoping that by letting Garcia go the full 12 round, it would lead to a big demand for a rematch by the boxing public. Unfortunately for Spence, the fans aren’t showing any interest in seeing him and Garcia fight each other again ever. They saw enough from last Saturday’s fight to know that Spence will beat Garcia every time no matter how often they fight. If Spence and Garcia fight 100 times, Spence would likely win all 100 of the fights with them becoming increasingly easier for him as he chooses to bulldoze him early rather than waiting until the 9th round to start throwing heavy leather. “Mikey is an excellent fighter, but this is a fight where even if Errol was a natural lightweight, he would have dominated it, because he was head and shoulders above Mikey even in the skill department early in this fight, and that was where he really showed his class,” Malignaggi said. “Late in the fight you make it a physical fight, and you say, ‘This is the Errol you expected.’ He’s a big guy, and he’s really taking it to the smaller guy earlier in the fight. But credit to Mike, by the way, for hanging in there, because he took a lot of punishment late in that fight. But early in the fight when it was a pure boxing match, he [Spence] was showing the levels of where he was at, and he was levels of above Mikey, which says a lot, because Mikey is a hell of a fighter,” Malignaggi said. Spence-Garcia was too one-sided for it to be a thrilling fight to watch. 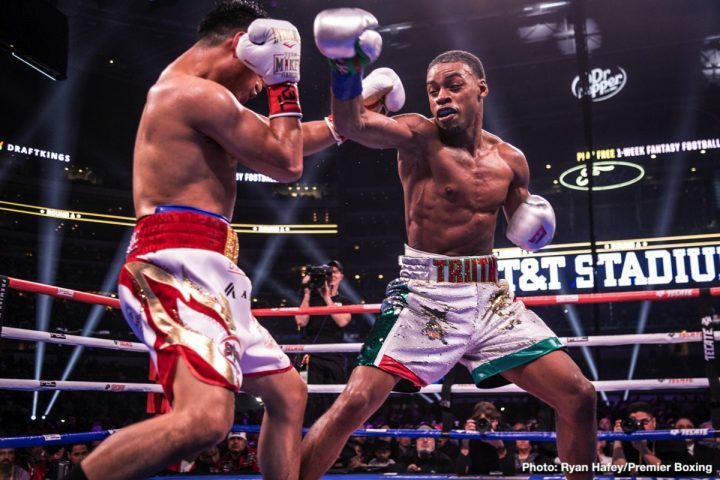 It was more like a boxing and punching clinic by Spence against a limited fighter, who lacked the size, power, reach and the work rate to compete. You can understand what Malignaggi is talking about when he says Spence would beat Garcia if he fought him at lightweight. The reason why is because Spence’s work rate and inside game would make it impossible for Mikey to beat him. Even if Spence’s power wasn’t the same as it is now, he would still be too good for Mikey due to his high work rate and his inside game. With Spence throwing 1,083 punches last Saturday, Mikey was forced to cover up for prolonged periods of time to ride out the nonstop shots. Had Mikey tried to start punching in between all those punches, he would have been clipped with something that he couldn’t block or deflect, and he would have been knocked out. So the only thing Mikey could do was cover up or try and hit Spence with a punch while he was coming forward before he would start t unload on him with nonstop shots.